Calling all Union County Democrats! Now that President Obama has outlined his agenda for the year in his State of the Union address, I think it is safe to say the 2012 presidential campaign is officially underway! Union County Democrats will gather this week and part of our discussion will be about the 2012 campaign. Please join us Wednesday, February 1st, from 5 to 6 p.m. in the second floor conference room of the Sac Annex at 105 Fir Street. Please join us on MLK day! The Union County Democrats are hosting an informal social gathering on Monday, January 16th, from 5:30 to 7:30 P.M. in the Maridell Center at 1124 Washington Avenue in La Grande. We’ll be serving hearty chili and cornbread along with fair trade coffee and good conversation. Local film maker and musician, Mike Surber, will be there with his guitar, his voice, and some tunes… perhaps a few from the debut solo album he recently recorded. So come and enjoy good food, good company, and good music. Bring a friend or two. Learn about local efforts in support of fair trade goods. Learn how to support the Friday Backpack Program. And learn about ways to help Democrats in this very important election year! Martin Luther King, Jr. Day is Monday, January 16th! Join with EOU students and community members for a march that begins at 11:00 am at Max Square in downtown La Grande. Black Student Union President, Jamarkus Worles-Springfield, along with other members of the BSU, will welcome participants and lead the march. The route goes along Adams to Greenwood, then up 8th Street to the EOU campus, ending at the Hoke Main Lounge. An open-mic program, along with light refreshments, will follow. Everyone is invited to share a poem, song, or reading focusing on diversity, human rights, or related issues. Please plan to participate in honor of Dr. King and his legacy. Oregon supporters of a universal, single-payer health care system are looking east for inspiration, bringing Vermont activists to our state to outline how a grassroots movement there resulted in the successful adoption of a universal health care system last June. La Grande is a stop on a twelve city swing through Oregon by three members of the Vermont Workers Center, Kate Kanelstein, Sarah Weintraub and Mary Gerish. They will be joined by representatives from the events’ sponsors, Jobs with Justice and Oregon Single Payer Campaign, as they outline the strategies and tactics that worked in Vermont. 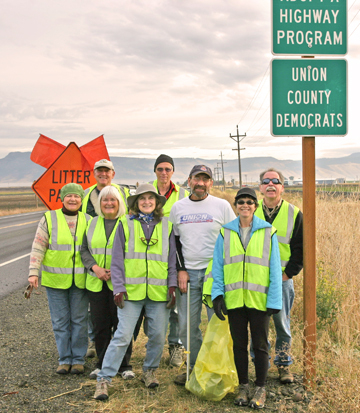 The Union County Democrats were occupied on Highway 82 doing their part to clean up America. The effort took the group about four hours. The weather was perfect and the trash buildup was not too bad. The Democrats clean up their adopted section of Highway 82 three times a year. Over the past few weeks Occupy Wall Street has grown from a handful of protesters in New York City to a national mobilization of tens of thousands. Demonstrations of more than 20,000 are occurring in New York. 10,000 people marched and filled Pioneer Square in Portland. More and more Occupy groups are organizing and demonstrating every day. And now... Occupy La Grande! 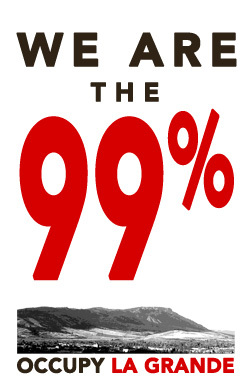 At noon on Thursday, October 13, Occupy La Grande supporters will gather in Max Square. Our focus is the same as groups all across the country: Jobs, Not Cuts; Fair Taxes on Everyone; Hold Wall Street and Corporations Accountable. We plan to march to Congressman Walden's office on Washington Avenue. We'd like to know where Mr. Walden stands on Contract for the American Dream. The contract outlines policies that will help rebuild the American Dream -- investing in our infrastructure, creating 21st century energy jobs, investing in public education, providing Medicare for All, making work pay, securing Social Security, returning to fairer tax rates, ending the wars and investing at home, taxing Wall Street speculation, and strengthening our democracy. We will then walk to Wells Fargo Bank and read the official statement of the Occupy Wall Street protesters. We want to highlight the increasing role that banks and other corporations play in buying elections and distorting democracy. We want to highlight how this influence benefits the wealthy and harms working families and the middle-class. Please join us. Share this information and bring your friends. Bring your signs to help focus our message: Jobs, Not Cuts; Fair Taxes on Everyone; Hold Wall Street and Corporations Accountable! Over the past few weeks Occupy Wall Street has grown from a handful of protestors in New York City to a national mobilization of tens of thousands. Demonstrations of more than 20,000 are occurring in New York. 10,000 people marched and filled Pioneer Square in Portland! More and more Occupy groups are organizing and demonstrating every day. And now... Occupy La Grande! Last month, Mike kindly agreed to conduct a seminar to expand on the ideas he presented in his article. If you weren’t able to attend on September 14, you missed an informative session! Here are some important concepts from the seminar. Many thanks to Sharon Evoy and Jerry Sebestyen for their notes! Wasn’t it great to be out at the Union County Fair – meeting good friends, enjoying the passing scene, and admiring the creativity and industry of our neighbors? The Fair is an enduring celebration of our way of life and our community. We invite you to get involved in your future with the Democratic Party of Union County, Oregon.